In bowl whisk together your oil, cayenne pepper, brown sugar, chili powder, garlic powder and smoked paprika, set aside. Place 4 chicken breasts in the bottom of a slow cooker, pour sauce over the top and cover and cook on low for 4-5 hours. Once shredded in small bowl whisk together your water and cornstarch and pour into shredded chicken and stir. Cover and cook on high for about 15 minutes to thicken a little. Meanwhile in large bowl mix together all your slaw ingredients. 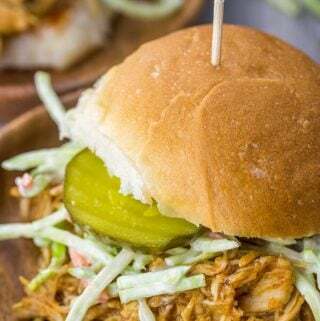 Place shredded chicken on bun and top with slaw and pickles.